After gorging myself on an excessive diet of horror movies last week, I'm back with a sensible sized portion of movies this time out. In other news, I decided to upgrade and get myself a Blu Ray player - which means I'm now up to date with the year 2006. At some point I'm going to trade in my Penny Farthing for a modern 'bicycle', and replace my fob watch with one of these new fangled 'wristwatches' I've been hearing about too. Made back in the halcyon days of the early '90s, Juice tells the story of four young men growing up on the mean streets of Harlem. We have the natural leader Raheem, his pudgy sidekick Steel, wannabe DJ Q and the crazy but charismatic Bishop, who leads his friends down a dark path when he persuades them to help him hold up a convenience store. 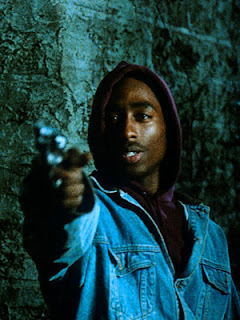 I used to be quite keen on this sort of hip-hop movie when I was a student - I remember really liking Boyz N The Hood (and to a lesser extent) Menace II Society. Watching this one some years later, some aspects of the film look pretty dated (such as the DJ scratching contest MC'ed by Queen Latifah), but overall, this is one of the better examples of the genre. The cast are generally solid, and include a supporting turn for Samuel L Jackson, but Tupac Shakur steals the show with his powerful performance as the charismatic but psychotic Bishop. On the negative side, the way the film ends seems highly implausible to me; without going into too much detail, one of the characters is shot in the arm, but is able to carry on running with barely a break in his stride - he then engages in a fistfight, using the arm in which he had previously been shot. I don't want to get too down on the movie, though - aside from that misstep, it's a well told story and definitely worth checking out. This recent Italian movie is set in an upscale but dreary Swiss hotel, where our protagonist, a mafia bagman named Titta di Gerolamo whiles away his hours. In a previous life as a financier in Southern Italy, he lost the mob a huge amount of money and as a result was placed in exile in Switzerland, unable to return to his family. His years of isolation have left him numb and lost in his own little world - until he forms an attachment to a waitress at the hotel which finally shakes him out of his torpor... I came across this movie as it was a Guardian journalist's selection for his favourite film in their recent series, and I'm glad that I did. The cinematography is cold, precise and beautiful - a perfect match to the movie's themes of isolation, loneliness and regret. It's all backed by an appropriately melancholy and dissonant soundtrack of modern electronica. As with Juice, my only real complaint with this movie is the ending - I don't want to give out any spoilers, but I wasn't convinced by Titta's motivations for acting the way he did in the final scenes. Otherwise though, this is a fine piece of filmmaking. In which Paul Newman reprises his iconic role as 'Fast' Eddie Felson, who is now a retired pool hustler schooling his raw young protege (Tom Cruise) in the arts of making money from his natural gifts as a champion nine-ball player... I'm not sure how LOVEFiLM sort out which movies from my list I get sent in the post, but occasionally, those films are linked together - as was the case this week, when I received a couple of pictures from the mid '80s starring everyone's favourite Scientologist, The Cruiser. To be honest, I'm not really a fan of the guy - his offscreen craziness has really affected my ability to accept him in roles where he's playing an everyday Joe. Still, I can't deny that at times he can be a very effective actor, and I've liked him in those roles where he decides to stretch himself - such as in his portrayal of the odious motivational speaker Frank Mackey in Magnolia. Unfortunately, this isn't one of those films - by the end of this movie I think we're supposed to feel bad that getting involved in the shady world of pool hustling has changed Cruise's character (Vince) from a loveable innocent into a . From my perspective though, Vince was pretty obnoxious from the start, so his journey from one form of obnoxiousness to another didn't really move me. This movie wasn't all bad though - this movie is a follow up to the classic The Hustler, was directed by Martin Scorsese and co-stars Paul Newman and (in a small role) John Turturro, so there are definitely a number of redeeming features. For me, the end of the film, when the emphasis was shifted away from Vince and back onto Fast Eddie (making his comeback as a pool player), was the most successful part of the film. Ultimately, I didn't really care too much about Vince's character arc, but seeing Paul Newman get back into action was really rousing stuff. Continuing my recent interest in David Cronenbourg movies, Rabid depicts the outbreak of a highly contagious rabies-like disease, which turns those infected into rage filled zombies, desparate for the sweet, sweet taste of human flesh. The outbreak is spread around by a Typhoid Mary-like young woman (Marilyn Chambers), who wakes up from a coma to find that she has an overwhelming desire to drink blood... I found this to be a very uneven movie - the first half hour, which sets the scene, is very slow-paced, and the budget constraints are all too apparent in the cheap looking hospital location and hammy acting of the cast. However, once the disease spreads to the city, the pace really quickens, and there are a number of genuinely scary (and a few very funny) scenes in which rabid zombies attack unsuspecting bystanders. Of course, being a David Cronenbourg picture, there is an element of bizarre body horror - it is established that for some inexplicable reason, the source of the new disease is a kind of fleshy stinger which grows out of Marilyn Chambers armpit while she's in a coma. Much like the fleshy USB ports in Existenz, it really has to be seen to be believed. The film is a bit of a mixed bag really and not as good as The Brood or The Fly, but it's still entertaining enough. So, here we have the second Tom Cruise movie of the week, and it represents an interesting contrast to The Color of Money. 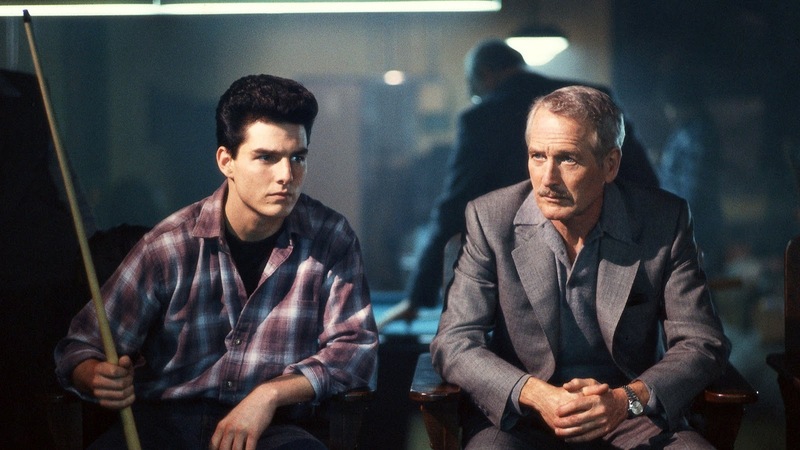 In the Scorsese movie, for me, Cruise really dragged the quality of the film down, as I found his the swagger and bravado of his character grating even before his transformation into an unscrupulous pool shark. 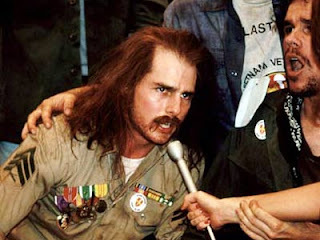 In this movie, directed by Oliver Stone, I was very impressed by Cruise's performance, in which he was required to portray real life figure Ron Kovic in various stages of his life, as Kovic progressed from wide eyed, all-American boy to angry, hard-drinking disabled veteran and finally to the anti-war protester that Kovic became. As I say, I really liked Tom Cruise's commitment to his performance here, so I think it's just a bit of a shame that this movie has some major issues. 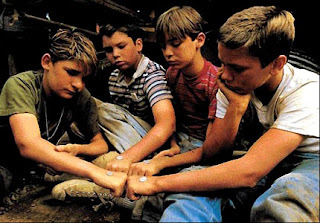 I felt that Oliver Stone could have really used a little subtlety and restraint in telling Kovic's story - as a powerful story in it's own right, it really doesn't need to be delivered in such a brazen fashion. Instead, in many of sections of the movie, he at times goes way over the top in making sure the viewer gets his anti-war message. The opening scenes are set in a wildly idealised nostalgic view of pre-Vietnam America, and pretty much every conversation held between the young Kovic and his schoolyard pals is designed to let us know that THESE PEOPLE HAVE BEEN BRAINWASHED BY THE GOVERNMENT. Things get better (and less OTT) in the effective scenes set in 'Nam itself, and the filthy VA hospital where Kovic finds himself after his injuries, but a scene late in the film in which a desparate Kovic hits ROCK BOTTOM by fighting (a similarly wheelchair bound) Willem Dafoe is so excessive that it becomes unintentionally amusing. Still, while directed in a very bombastic way, Stone gets his message across, and when he isn't bashing us over the head with his beliefs, some of the quieter scenes, in which Kovic comes to realise what he's lost, are very moving.